I made this dish when our friends Fiona and Mark came to the farm for the weekend recently. It was inspired by a meal we enjoyed in Tuscany last year. Fiona says she’s made it four times since then, so I thought I had better make it again and record it on the blog, before I forget about it. The recipe is very quick. Quantities depend on how many you’re feeding. Line a shallow baking tray with baking paper and arrange the salmon portions on top. Preheat the oven to 200°C. Place the macadamia nuts and parsley in a food processor and pulse until chunky. Add a drizzle of oil through the feed tube with the motor running. Season to taste then spread over the salmon pieces. Bake for 8-10 minutes. Don’t overcook as the nuts will burn. Top and tail the zucchini then cut into thin ribbons using a vegetable peeler. Discard the first and last slice which will be all skin. Steam for 4 minutes or until al dente. Drain thoroughly then add butter or olive oil and season to taste. 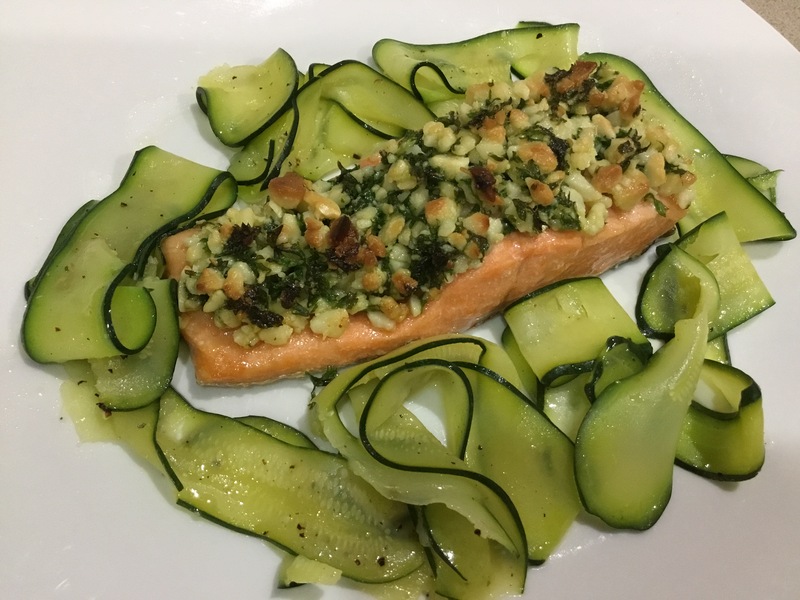 Arrange salmon in the middle of serving plates and surround with the zucchini ribbons. Variations: use pine nuts instead of macadamias and use chives or basil instead of parsley, or a mixture of two herbs. This starter, adapted from a recipe I found for smoked salmon, is delicious and light. If you’re a fan of sushi you won’t be put off by the idea of eating uncooked salmon. 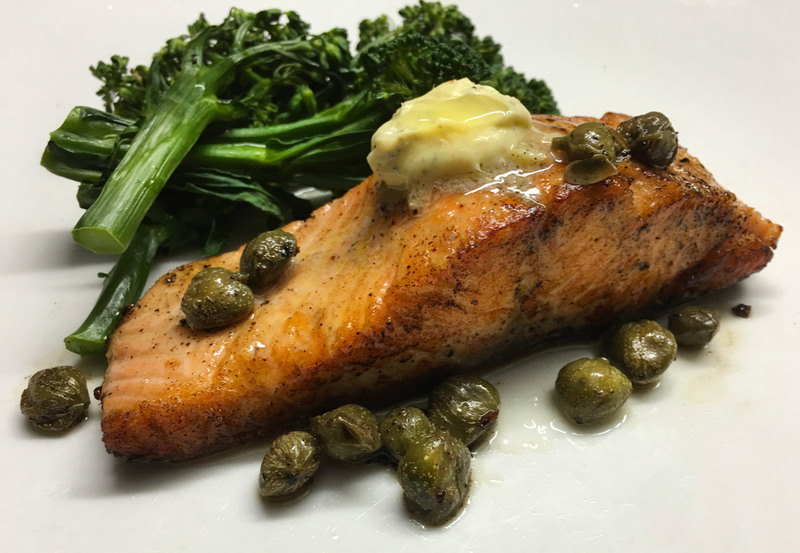 It really doesn’t taste raw, but you could always use smoked salmon or Gravlax instead of the raw fish. 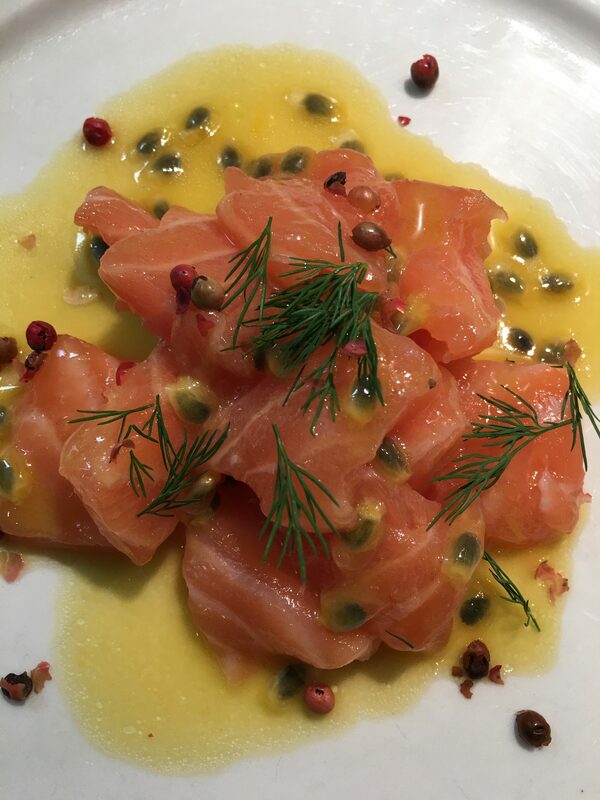 The flavour combination of salmon, orange and passionfruit is a winner. Remove skin then cut salmon into small bite-sized pieces. Refrigerate while you make the sauce. Sieve the orange juice to remove any pulp. You will need 2 cups after sieving. Place in a saucepan and boil to reduce to about two thirds of a cup. Place in a jam jar with the honey, passionfruit pulp, oil and seasonings and shake well. Adjust the amount of passionfruit pulp and oil to taste. Mix half the dressing with the salmon then divide among the plates in a pile in the middle. Spoon additional dressing over and around the salmon then garnish with the dill and pink peppercorns. You may not need all the dressing. Variation: to make a more substantial dish add some diced avocado and serve on a bed of lettuce or rocket leaves. Note: so-called pink peppercorns are not peppercorns at all. They have a very special, slightly perfumed flavour and can be found in specialty cook shops such as The Essential Ingredient. They go well with any salmon dish. When you’ve been cooking as long as I have it’s not often you come across a technique you’ve never seen before. Cooking is a bit like fashion. Old recipes and ingredients are revived and tweaked, but there’s very little that’s totally new. So as I was flicking through an old Delicious magazine recently and saw a recipe for making cauliflower into rice I thought, now that’s interesting, I wonder if it works? Well it does. 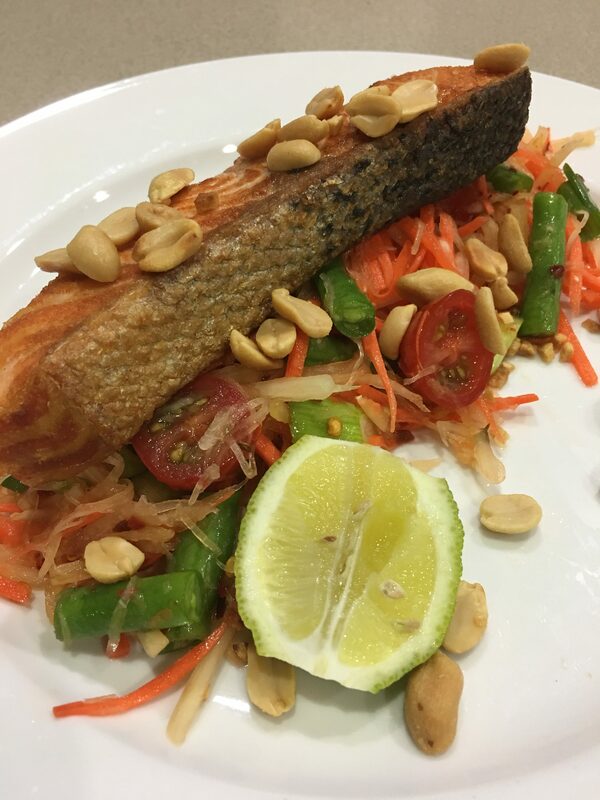 Here the rice is flavoured with coconut milk and cashew nuts and served with pan-fried salmon. But once you have the basic idea of blitzing raw cauliflower in the food processor to make rice you can use different liquids and flavourings and serve it with any meat, fish or even eggs. I know I’ll be trying all sorts of variations. Great for anyone trying to cut down on carbs. Melt 2 tsp coconut oil in a large heavy-bottomed saucepan. Add onion and cinnamon and cook, stirring for 3 mins or until golden. Whiz cauliflower in food processor until finely chopped like rice – watch carefully as you don’t want to over-process it. Add to pan with the cumin, turmeric and dried chilli. Cook, stirring for 3 mins then add coconut milk, cashews and water. Season to taste, then partially cover and simmer over moderate heat, stirring occasionally, for 15 mins or until thick. If not thickened when cooked remove lid and cook a bit more to reduce the liquid. Melt 2 tsp coconut oil in a large non-stick frying pan. Season salmon then cook, skin-side down, for 4 mins or until skin is crisp. Turn and cook for a further 3 mins or until just cooked. Remove to a plate and keep warm. 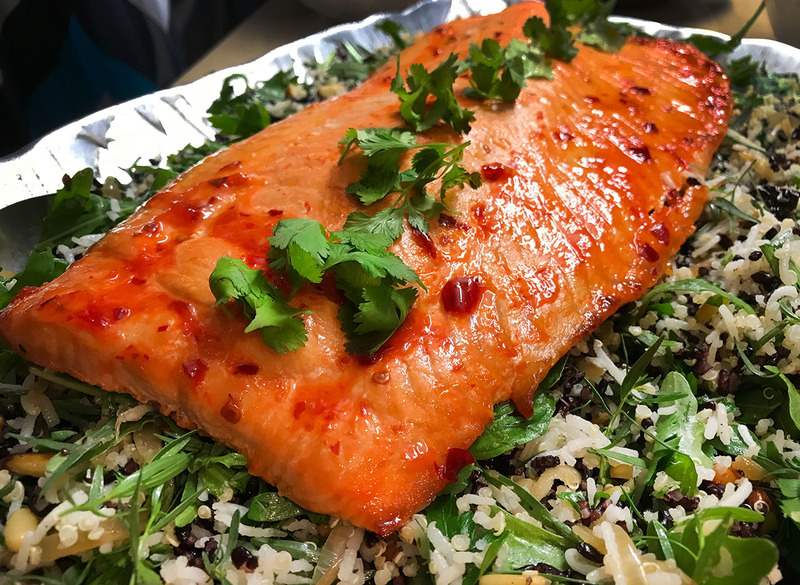 To the pan where you cooked the salmon add the remaining 1 Tbs coconut oil and when hot add mustard and coriander seeds and cook for a minute or until they start popping. Remove from heat and stir in the orange juice. Divide the cauliflower rice among 4 plates. 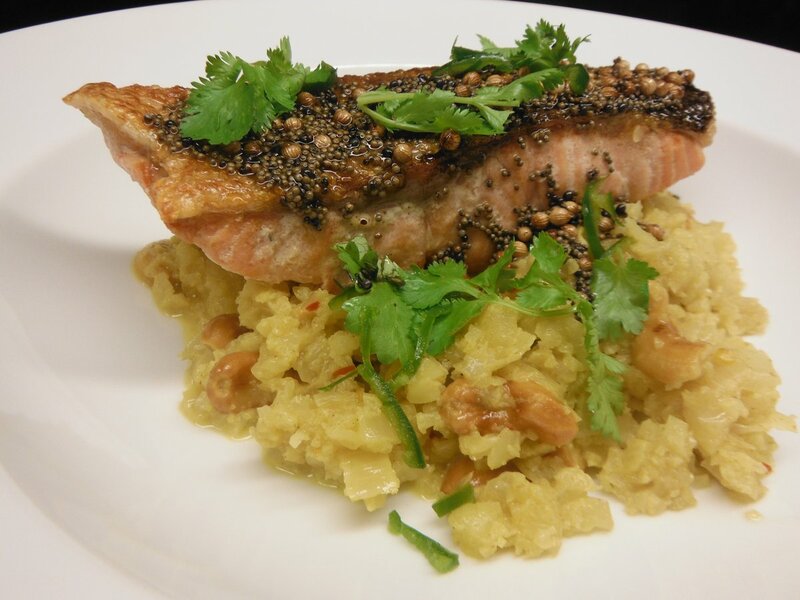 Top with the salmon, spoon over the coriander seed oil. Garnish with the green chilli and coriander leaves. Over the years I’ve tried lots of recipes for potato cakes, latkes and rostis. Some used whole eggs and plain flour, while others used none of the above. None of them have ever quite hit the mark. This recipe, based on one from Yotam Ottolenghi, uses egg whites and cornflour and from now on I won’t use any other. He uses a combination of grated potatoes and parsnip, but I used all potatoes and they were delicious. Ottolenghi says to use Desiree potatoes. I used Kipflers from the garden, because that’s what I had, and they worked well. Serve one potato cake as a starter, or two as a light lunch or supper, perhaps accompanied by a cucumber salad. The potato cakes are best served immediately, but you can make them ahead and reheat them briefly in a hot oven. Tip grated potatoes onto a clean tea towel, draw in the sides and squeeze to remove as much moisture as possible. Place potatoes in a bowl with the egg whites, cornflour, salt, pepper and chives and mix well. Heat half the butter and half the oil in a medium non-stick frying pan. Make three or four potato cakes using about 3 Tbs of mixture for each and about half the mixture. Cook for 2-4 mins each side over medium heat, or until golden brown and cooked through. Drain on paper towels and keep warm in a low oven. Add remaining butter and oil to the pan and make three or four more potato cakes. 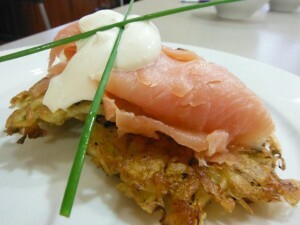 Serve potato cakes (one or two per person) topped with smoked salmon, sour cream and a couple of chives. 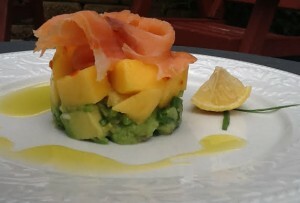 My Swiss friend Esther served this simple but delicious starter for a ladies lunch she hosted. 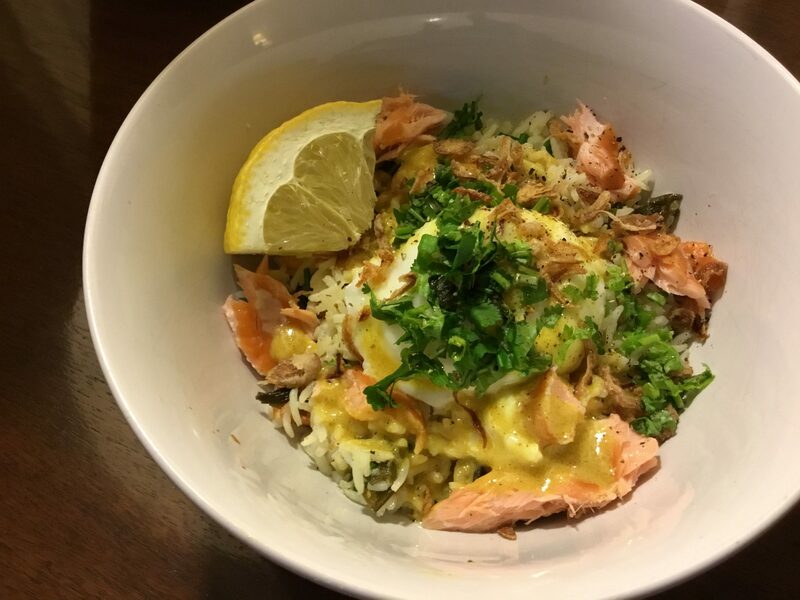 You can use smoked salmon or smoked trout and the recipe is easy to halve for two people. Served with a rocket salad and some crusty bread it’s enough for a light lunch. Arrange four stacking rings on serving plates. Mix avocado with spring onion, coriander and lime or lemon juice. Season to taste then divide among the stacking rings and press down firmly with a spoon. Mix mango with chilli, place on top of the avocado and press down. 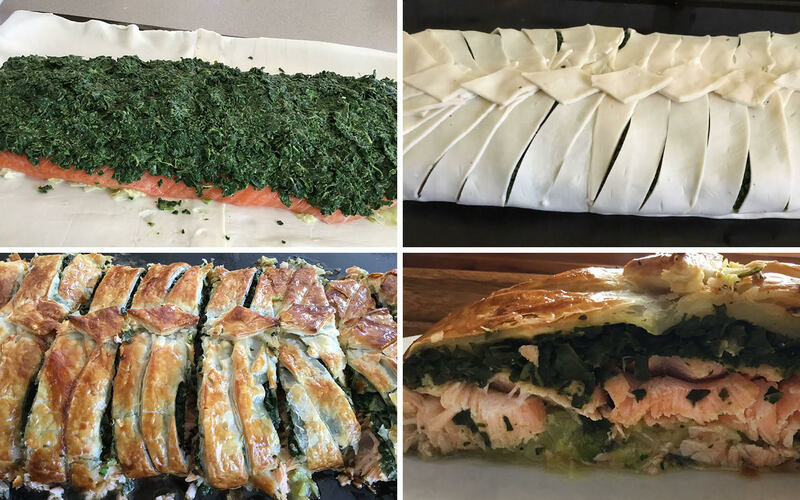 Top each serving with a slice of smoked salmon or trout. Remove stacking ring then garnish plates with a lemon or lime wedge, a couple of pieces of fresh chive and a drizzle of olive oil.